The films that have been made by The Walt Disney Company in the 85 years of its existence number in the hundreds, and you’d be hard pressed to find one film that everyone agrees is the best. However, there is one Disney film I feel doesn’t get brought up enough in conversations concerning the best of the Disney canon, and that’s Fantasia. Whenever I bring up Fantasia in a social setting, people either haven’t seen it, don’t remember it, or don’t like it. This astounds me, and I would like to attempt to correct what must be a universal glitch by bringing this film to your attention, because I believe Fantasia is not only the best Disney film ever made, but one of the greatest films ever made, period. For those not in the know, Fantasia is an animated film released by Disney in 1940. What’s the story? Well, there isn’t one. And yet there are technically multiple. (Watch Fantasia Trailer at YouTube.) The film is done in the style of an orchestral concert. It begins with a live action scene of an orchestra, namely the Philadelphia Orchestra conducted by the renowned Leopold Stokowski, tuning their instruments. We are then introduced to music critic and master of ceremonies, Deems Taylor, who introduces us to the program, which are various segments composed of classical music pieces accompanied by animation. Before each segment, Taylor gives context for the music and animation the audience will hear and see. The segments themselves vary in terms of story and musical interpretation. There are straight forward segments that tell a story, like The Pastoral Symphony, which shows us a Greek mythological setting and how the inhabitants of this setting eventually become target practice for Zeus and his lightning bolts. There are segments like Toccata and Fugue in D Minor which contain no story to speak of, but abstract and surreal images that complement the music. “Music that exists simply for its own sake” as Taylor puts it. Finally, there are segments like The Nutcracker Suite that are a mixture of the other two forms. It has no real story, but “does paint a series of more or less definite pictures.” Like a painting or a piece of classical music, consensus on what many of the segments mean in a philosophical or artistic sense isn’t spelled out for you. It’s just meant to be shown and to be pondered. The Rite of Spring, for example, is simply the birth, life and death of the dinosaurs. From their emergence out of the primordial ooze, to their extinction. To this day, I’m still unsure on how to take that segment to heart, but it leaves room for plenty of interpretation and it’s one of many unforgettable visual experiences. The animation that walks alongside these timeless pieces of music is breathtaking. The idea of putting images to classical music, a simple yet genius idea that hadn’t been done before Fantasia, is used to its full advantage. There are beautiful hand drawn landscapes encompassing prehistoric Earth, the changing of the seasons, abstractions, plains, mountains, oceans, comets and a ballet with dancing ostriches, hippos, elephants and alligators. The choice of colors, the use of shadows and light and their contrast with other shades and colors in various segments are one of the greatest uses of colors and shadows I’ve seen in a film. Night on Bald Mountain and Ava Maria, my two favorite segments of the film, embody these techniques with the dark and light colors of each piece contrasting and complementing each other perfectly, both visually and thematically, and ends the film on an extremely high concerto note. Fantasia’s creativity with its visuals and how it applies those visuals to the music is truly a sight to behold. Fantasia is unlike any film Walt Disney ever made. It’s narratively unconventional and wholly unique, delicate yet powerful, and beautiful on multiple visual and emotional levels. It’s the first Disney film that was created entirely for a mature audience, and it still holds up as such, walking cartoon brooms and dancing hippos in tutus notwithstanding. And yet when I bring up Fantasia in casual conversation, I get a shrug or look of disinterest. Why is that? Does the classical music turn them off? Are they too attached to traditional narrative storytelling? Does its age intimidate them? Am I just hanging out with the wrong people? I’m not sure. What I do know is that Fantasia is an animated masterpiece that more people should see and respect. Blake Meadowcroft was born and raised in Washington state and he’s too lazy to move to another one. He graduated from Charles Wright Academy in 2014, and then Central Washington University in 2018 majoring in Film and Video Studies with an emphasis in critical studies. He was a DJ for two years at 88.1 The ‘Burg, his college radio station, and has some experience in stand up comedy. In layman’s terms, he’s really good at watching movies and saying if they’re good or not. His parents didn’t really put a cap on how many or what kind of movies he was allowed to watch when he was growing up, so he kind of……went crazy. He is passionate about film history and filmmaking, and approaches his reviews with both a critical mind and a witty sense of humor. He doesn’t like to pick favorites in terms of genre (although if you were to twist his arm, he’d probably go with fantasy). He’s willing to give any kind of movie a chance and doesn’t judge it based on what kind of film it is, but how well it’s made. Blake has volunteered and interned for multiple film festivals including the Ellensburg, Gig Harbor, and Tacoma film festivals. He lives in Lakewood, and is currently a film critic for Lakeside Living Magazine. Thanks for sharing Blake. 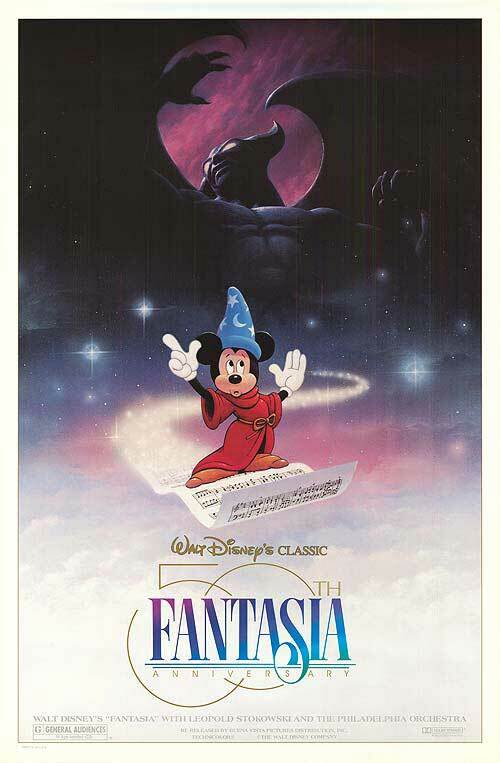 One of my fondest memories was made by the re-release of Fantasia in theaters during the mid ’80s. It was the only movie that I ever went to with my late grandmother and I was amazed at the awesome explosion of light and sound. It ended up helping to develop my love of music for its own sake. Though it often takes some persuading, most people I’ve known really enjoy Fantasia once introduced to them. Thanks for the plug for a great movie. I’m gonna guess Fantasia’s lack of popularity is due to its basis in classical music. Classical music just doesn’t seem to be as popular as it was back in 1940, except for little snippets of well known pieces. (I see Kreig’s “In the Hall of the Mountain King” is making a comeback in commercials.) That said, you are exactly right, Fantasia is brilliant and is one of the best and the most innovative movies of all times. Your article makes me want to run up and watch my copy, except I’d have to go through some hoops to connect my VHS player. I need to get it on DVD.